The longtime New Yorker European correspondent gathers a selection of her finest food-and-travel essays. Kramer (Lone Patriot: The Short Career of an American Militiaman, 2002, etc.) shares 13 pieces that she published in the New Yorker between 2002 and 2017. She divides the book into four sections that emphasize theme over chronology. Part I introduces readers to Kramer’s Upper West Side kitchen, a space where food, writing, and memory are inseparable. 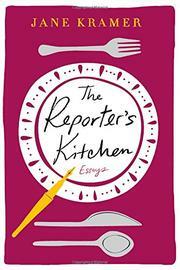 She remarks how certain topics—for example, French politics—will inspire her to make certain dishes, such as chicken tagine, which she associates with “the French-speaking sheikh whose wives taught me how to make it.” In Part II, Kramer offers in-depth profiles of respected food writers and chefs from around the world. In one essay, she tells the story of how a mutual interest in Asian cuisine and traveling brought Jeffrey Alford and Naomi Duguid into an elite circle of food scholars; in another, the author narrates how Yotam Ottolenghi, a brilliant philosophy student, followed his passion for cooking from his native Jerusalem to London, where he opened a wildly successful fusion restaurant. The author’s own adventurous spirit takes center stage in Part III, where she reflects on such subjects as her never-ending personal improvement “quest” to collect cookbooks; her quirky interest in root vegetables and forks; and on how an experiment in foraging eventually led her to Denmark and René Redzepi, the forager-chef/visionary behind the world-famous Noma restaurant. In Part IV, Kramer explores the relationship between food and various forms of ritual. She discusses Thanksgiving and her experiments observing this most revered of American traditions during one summer in Italy. As she notes in the concluding essay, celebrations—especially those that include food—mark a “passage from the ordinariness of daily life into the next round of daily life by way of a salubrious diversion.” Eloquent and charmingly loquacious, Kramer's essays are sharp and insightful. A joyous feast of food, travel, and human relationships.